Inclusive Guided Land Tour in Iceland with Whale Watching! 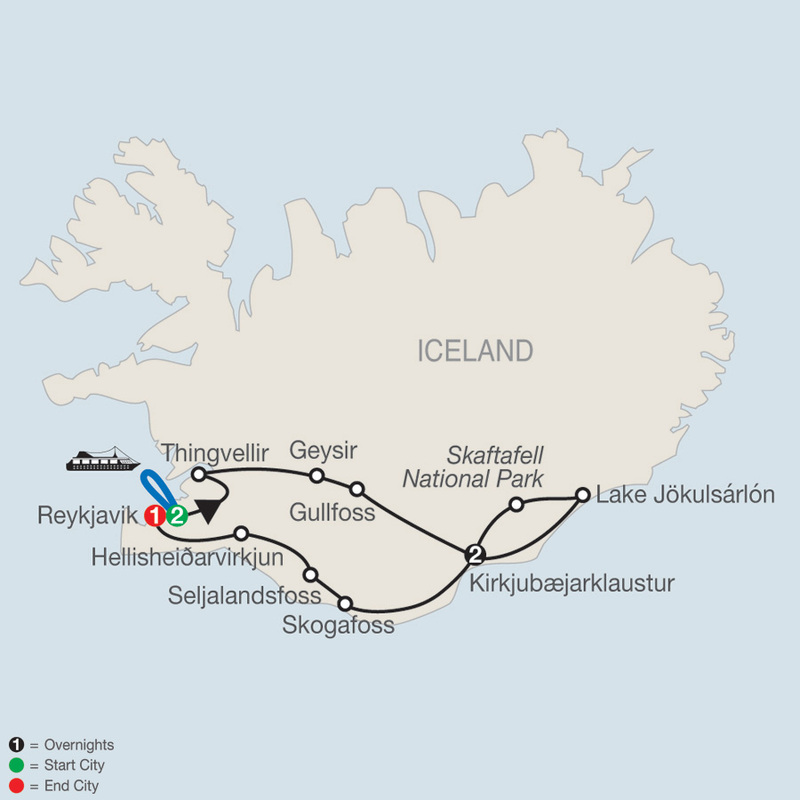 Our experts have handpicked this Globus Gems of Iceland Journey with whale watching May 26-31, 2019. (Arrival from U.S. May 25 - airfare not included). If you have worked with a Cruise & Travel Experts agent in the past, please specify who here. Save $600 per couple on a Gems of Iceland tour for travel from Jan. 1 – Dec. 31, 2019 when you book it by February 28, 2019! Globus has also included some out-of-the-ordinary experiences to make your Iceland vacation special. In Thingvellir, a UNESCO World Heritage Site, walk through the rift valley that marks the separation between the North American and European tectonic plates. In Geysir, meet the chef of the restaurant in the geothermal areas, and taste freshly baked bread cooked using the heat from the hot springs. You’ll wash it down with a glass of Geysir schnapps. Another unique and unforgettable experience Globus offers is a boat cruise to see whales in their natural habitat. Welcome to Reykjavik! At 6 pm, meet your Tour Director and traveling companions for a welcome dinner at your hotel. This morning’s optional excursion to the Blue Lagoon needs to be pre-purchased via our website and is not available locally. April 14-September 22 include an afternoon excursion by boat to watch whales in their natural habitat. After a drive through cosmopolitan Reykjavik, continue to Thingvellir, a geological paradise. Here, walk through the rift valley that marks the separation between the North American and European tectonic plates. Next, stop at the hot springs at Geysir for a real treat: meet the chef of the Geysir restaurant in the geothermal areas. Taste freshly baked bread, which is cooked using the heat from the hot springs, with Icelandic butter, boiled eggs and herring, and a glass of geysir schnapps, served at freezing point. Marvel at the mighty Gullfoss waterfall. Drive through the national park at Skaftafell and stop at Lake Jökulsárlón, where some of the most spectacular scenes of the James Bond movie Die Another Day were filmed. Watch how the largest glacier in Europe, Vatnajökull, flows into the lake, forming icebergs. An exciting optional boat trip through the icebergs is available, weather permitting, before returning to your hotel. Enjoy a spectacular drive along Skogafoss and Seljalandsfoss waterfalls and see the Eyjafjallajökull volcano, well known for the eruption that generated the massive ash cloud in 2010. Arrive in Hellisheiðarvirkjun, where you will visit the geothermal heat and electric POWER STATION. Return to Reykjavik and tonight, a farewell dinner has been prepared at one of the city’s fine restaurants to celebrate the success of your Icelandic journey.